Strawberry Jun in June: Summer flavor mmm! 3. If you are feeling more adventurous, add about 1 tsp of fresh grated ginger per pint. 4. Put it in the refrigerator. 5. Wait at least one day for the flavors to merge, and then consume! You can eat the strawberries straight out of the brew. They make an attractive addition to the bottle. I don’t have a real picture to show you, because I CONSUMED IT ALL! 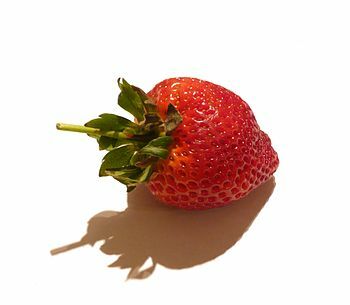 This is my problem with strawberries. They have a very short shelf life in this house. In fact, when I’m chopping them for a prepared item, half of them are in my belly before they hit the bowl. P.S. Two days later, I found a hideaway in the fridge. Here’s your pic! I’m sending a fresh Jun mother out to Kathleen in Missouri. 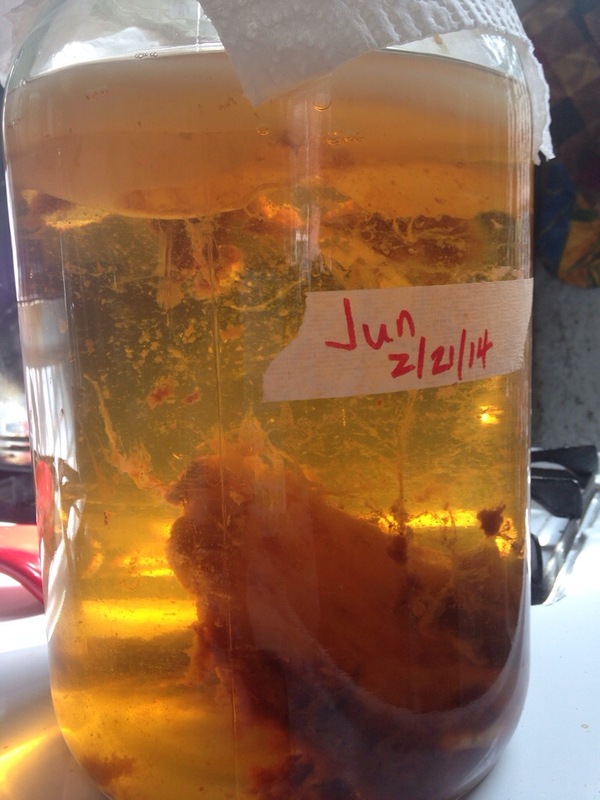 Here is the SCOBY in her batch of Jun just before I packed her up. 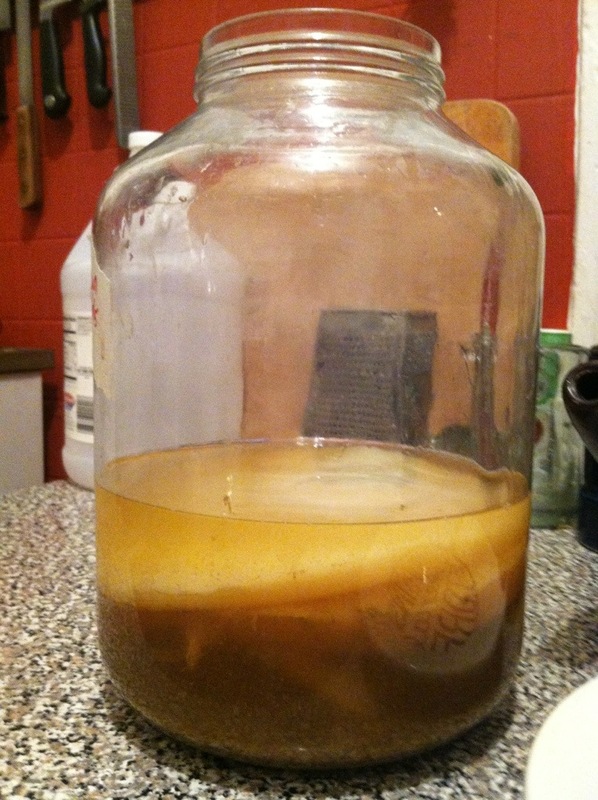 Notice the old SCOBY is still floating low in the brew. 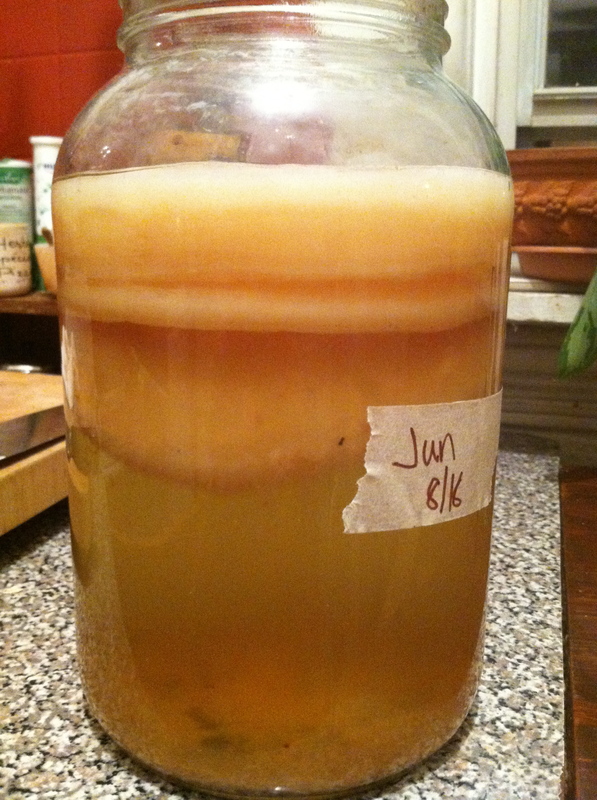 Jun tends to make more sediment than Kombucha, which you can also see at the bottom of the jar. The brown stuff hanging down from the SCOBY is strands of yeast, to my knowledge. This can be consumed in the beverage or filtered out. The new Jun Mother is floating at the very top of the brew. 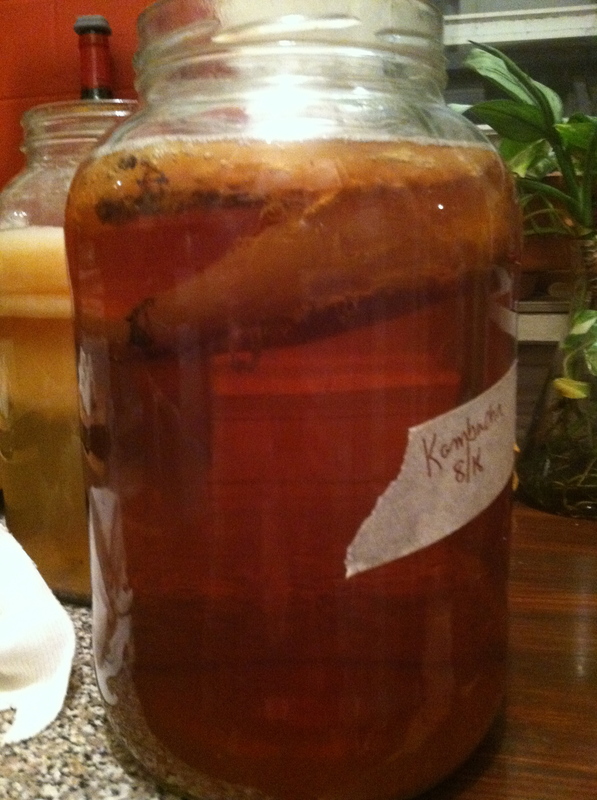 Kombucha: Getting the perfect fizz. 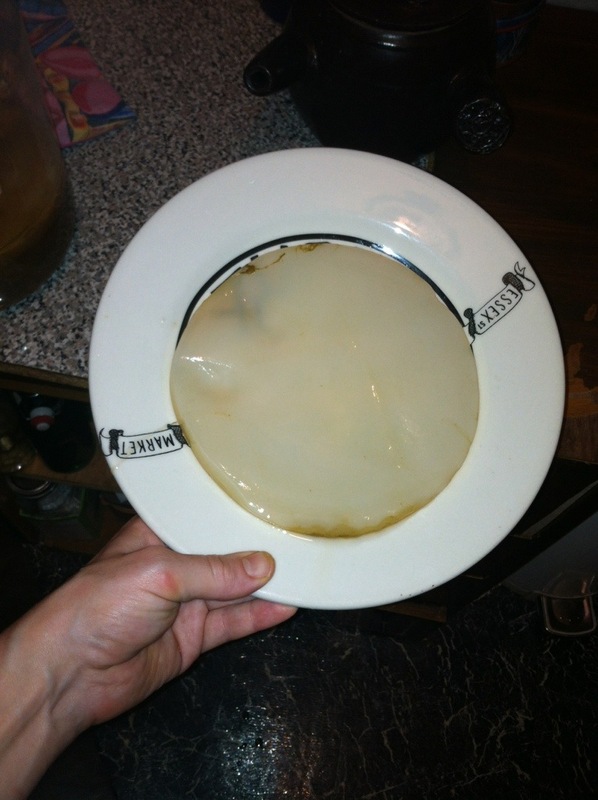 I could write up a list of troubleshooting tips for kombucha, but if someone else has already done an exemplary job, why should I bother? Len Porzio’s site is a great reference for kombucha makers who want a more consistent batch, complete with a handy trouble-shooting chart. 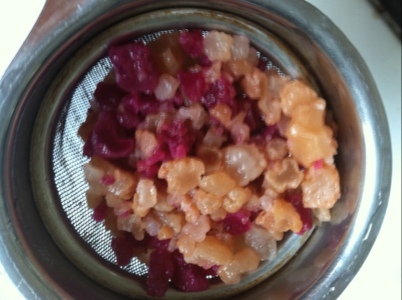 I have certainly run across a lot of variation in my brews, but I never disliked a batch enough to put so much thought into brewing time for the tea and such…. Yes, my connoisseurship is lacking.